We’d love your help. Let us know what’s wrong with this preview of Unseen by Sara Hagerty. In Unseen, Sara Hagerty suggests that this is exactly what God intended. He is the only One who truly knows us. He is the Every heart longs to be seen and understood. Yet most of our lives is unwitnessed. We spend our days working, driving, parenting. We sometimes spend whole seasons feeling unnoticed and unappreciated. So how do we find contentment when we feel so hidden? To ask other readers questions about Unseen, please sign up. This book is a gift and treasure. It inspired me to live a life that is deeper in relationship with God. It's practical, engaging, full of scripture, and yet a book that draws you to stop, think, digest, and process the ideas given. I will re-read this book to soak in the ideas and even to remember how Sara Hagerty shares her poetic words of how she adores God til she knows it's true in her life! Sara Hagerty shares her personal stories and connects the story of Mary's extravagant love poured ou This book is a gift and treasure. It inspired me to live a life that is deeper in relationship with God. It's practical, engaging, full of scripture, and yet a book that draws you to stop, think, digest, and process the ideas given. I will re-read this book to soak in the ideas and even to remember how Sara Hagerty shares her poetic words of how she adores God til she knows it's true in her life! Sara Hagerty shares her personal stories and connects the story of Mary's extravagant love poured out vulnerably at Jesus feet, to a lifestyle of seeking Him in all seasons, but especially in the hidden aspects of life. Authors often become kindred spirits or mentors to the reader, and Sara Hagerty, is that for me. I adored her first book, Every Bitter Thing is Sweet when I discovered it several years ago, I love how she ends each chapter with scriptures for further review. And I'm half way through writing out the scriptures from Unseen in my journal, and processing small steps to see God more intimately and to fall in love more deeply with Him. I can't wait for the Bible Study to be released that goes along side this book, and it will be free on the website www.sarahagerty.net/unseen. I'm going to need a whole series on my blog to share all the aspects of the book with the world, as it's a gem with so much richness, I'm inspired, encouraged, and learning how to have a fuller, hidden life with God, where I use the white space in my life to seek Him. I'm blessed to be on the launch team for this book, inspired by the emphasis on praying for the book release, and the readers whose hands it will be placed in, that they would find God and fall more in love with Him this fall (or in the future). I certainly have, and I've preordered several copies as gifts for several friends who will find inspiration. *re-frame your life in God and before others by asking questions like: What does God think of this? and What does God think of me? *see a fresh revelation of the story of Mary at Bethany sitting at Jesus feet. *create a wonder hour to look at God more purposefully. *love the Word of God more. *look at Who God is. *recognize how to practice God's love. *recognize you are seen by God alone (Psalm 139- woven together intimately). *develop deeper intimacy with God. We’re drawn to where we come alive, to where our passion takes flight. To where we are known. We want to be with those who know us and remind us of what we like about ourselves. Those who invite us to consider our lives as much bigger than what our eyes can see. Only the Lord can truly be that one who knows us and loves us that way. I so admire Sara’s relationship with Jesus. Very humbling, encouraging, and beautiful. I received this book as an advance reader copy and was so eager to dive in and get through it. Sara’s last book, “Every Bitter Thing Is Sweet” has left an impact on my that few other books have. My goal was to get through it as fast as I could, but as I dove into the first chapter, it was evident that wouldn’t be the case. This is not a book that I could devour and set aside. At the end of each chapter I was left challenged and with a heap of scripture that often leading me down a rabbit trail i I received this book as an advance reader copy and was so eager to dive in and get through it. Sara’s last book, “Every Bitter Thing Is Sweet” has left an impact on my that few other books have. My goal was to get through it as fast as I could, but as I dove into the first chapter, it was evident that wouldn’t be the case. This is not a book that I could devour and set aside. At the end of each chapter I was left challenged and with a heap of scripture that often leading me down a rabbit trail into the word of God. In this book, Sara puts words to something that many, if not all of us are feeling, especially in the world where it is so easy to base our worth on likes and views and followers. What she is calling us to is a so much more, and most often times counterintuitive to our do and tell human nature and certainly to today’s culture. She is suggesting where we may come to resent the unnoticed and misunderstood areas of our lives are the exact places where we can hide ourselves in Christ, and only then can experience true freedom. It is an invitation to dive so much deeper than the surface, to look so much farther than what our eyes can see, to really begin to find our worth in the One who created us. It is a journey that I believe will be deeply personal to each person, yet a place where we all have common ground. Thank you to Zondervan and NetGalley for the free review copy of this novel. All opinions in this blog are my own. I have had this book for a few months and pushed off reading it because life happens, specifically school. I decided to pick this book up last week, but first I did some research on the author. I found a free reading guide that goes with this book on her website. It was a fantastic extra to have and work through while reading this book. This book came during the perfect season for me. Sometimes, I want to be noticed. I want attention. This book helped me discover new things about my faith. It's easy to get caught up in the desires of the flesh, and this book helped give me a smack in the face. I liked how this book focused on Mary featured in John 12 - she's the woman who anointed Jesus's feet with the perfume. Through every chapter, the story of Mary was explained in depth by using examples from Hagerty's own life. I enjoyed how this book continually linked back to scripture. At the end of every chapter, there were verses to look up. I like how some of these verses were used in multiple chapters and how more verses were added into what had already been read. I found the repetition of these verses helped me memorize and tuck them away for when I need them. I just love her. I admire her intimacy with Jesus and her vulnerability. Both of her books have moved me to fall more in love with my savior. Hagerty starts off explaining how she was sucked into the trap of thinking the way society prompts us to. When a friend spotted her working in a gift sho This book has a beautiful cover, matched with one of my favourite themes, the blessedness of being unseen. Sara Hagerty helps us develop a new way to approach being un-applauded, unnoticed and unrecognised. Instead of regarding it as falling short of our potential, she invites us to see that being hidden from sight is often the best place to be. In a world that is full of selfies and people clamoring to be both heard and seen, it is hard to feel like one who is noticed, let alone actually seen. In Unseen by Sara Hagerty, she shares how we are seen by God even when it feels like we are not seen by anyone else. Unseen is Hagerty's intimate look at how God sees us and our productivity when we feel like we aren't doing anything valuable. We may feel we are wasting away somewhere but those may be the times we are reading His Word and drawing In a world that is full of selfies and people clamoring to be both heard and seen, it is hard to feel like one who is noticed, let alone actually seen. In Unseen by Sara Hagerty, she shares how we are seen by God even when it feels like we are not seen by anyone else. Unseen is Hagerty's intimate look at how God sees us and our productivity when we feel like we aren't doing anything valuable. We may feel we are wasting away somewhere but those may be the times we are reading His Word and drawing closer to Him. God wants to be our friend and to be friends we need to spend close time together. Weaving stories of her life and stories from Scripture, Hagerty shares how God sees us, how we can communicate with Him throughout the day, and how to hear His Voice more loudly among the sea of voices around us. Each chapter also invites readers to dig deeper into God's Word and read verses related to the chapter in a section called, For Your Continued Pursuit. I honestly felt encouraged to study more on my own and to continue to grow closer to the God who made me. In Hagerty's words, "I invite you to use these passages as starting points for hiding in God, for wasting time adoring Him, and for making His Word part of your everyday language." I especially liked this. Unseen has touched me in some deep places. My weary soul has alternately sipped and gulped her words up. I could relate to so many of her feelings and stories even though my life is much different than hers. My word for this year is "Delight." Unseen reminded me that God delights in me and why I delight in Him. Hagerty refreshed my spirit that has been hidden in work and difficult challenges these past few years and I have soaked it all up. Hagerty's words to her daughter about Psalm 18:19 on pages 152-154 were also meant for me (and you) and I have read them and re-read them. Hagerty's gentle words, stories and sharing of Scripture felt like just the encouragement I needed but don't hear much right now. If you are looking to draw closer to God, be seen by Him and to hear His voice, I encourage you to read Unseen. Hagerty points us to Him throughout the book and helps the reader hunger for that Unseen time alone with God. Unfortunately, I could not finish this book. I made it about 75% through and it is very rare for me not to be able to finish a book that I start. This is probably the first time in years that I was not able to get through a book. Every chapter in this book felt the same to me. This was not what I thought it would be about and I kept attempting to come back to it, but found it very irrelevant to my life. I could not relate to any of the examples that she gave. There were a few scattered nuggets o Unfortunately, I could not finish this book. I made it about 75% through and it is very rare for me not to be able to finish a book that I start. This is probably the first time in years that I was not able to get through a book. Every chapter in this book felt the same to me. This was not what I thought it would be about and I kept attempting to come back to it, but found it very irrelevant to my life. I could not relate to any of the examples that she gave. There were a few scattered nuggets of truth throughout, but the book was a very boring read overall. I still gave this book 2 stars, because while it is not relevant for me it may be for someone else. You may like this book if you are a parent, especially a parent of adoptive children. It also has beautiful cover art. 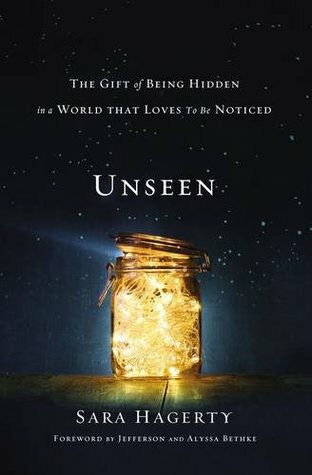 In her spiritually uplifting and deeply enlightening book, "Unseen", Sara Hagerty eloquently writes about the extraordinary gift of being unseen in a very noticeable world. Sara's heart longed to be seen and understood. Yet, sometimes she felt unwitnessed, unnoticed and unappreciated. Struggling through her own personal spiritual experiences, Sara painstakingly confronts a peculiar moral dilemma when she questions her faith as to whether God who loves her when she serves Him in full-time ministr In her spiritually uplifting and deeply enlightening book, "Unseen", Sara Hagerty eloquently writes about the extraordinary gift of being unseen in a very noticeable world. Sara's heart longed to be seen and understood. Yet, sometimes she felt unwitnessed, unnoticed and unappreciated. Struggling through her own personal spiritual experiences, Sara painstakingly confronts a peculiar moral dilemma when she questions her faith as to whether God who loves her when she serves Him in full-time ministry work, still loves her when she is unseen and does not do anything for Him. As Sara struggles to come to terms with her doubts and fears, Christ weeps unseen for her and for a lost world that neither recognizes His presence nor cares about Him. As we lift up our faces to Him, dazzled by the radiance emanating from that most beautiful of countenances, He reaches out to us, smiling that most wondrous of smiles. Sara Hagerty heard His tender whisper, gently calling her to Him, through all the pain and loneliness of being unseen in a very noticeable world. Each time Sara's desperate heart broke in despair with the agony of being unseen in a world she did not feel she belonged to, Christ sought her, reaching out to her lovingly and engulfed her in His warm embrace. Through pain and perplexity, Sara found intimacy with Jesus. When life stpped for her, God met her at her greatest point of need. His Word and His whisper took on new meaning to her in the darkness of despair. Sara found God in the most unlikely places. In the hustle, bustle and shuffle of life, Sara’s writings invitingly beckon us to God, who sees us, as we find our way back to Him. When we feel unnoticed and invisible, our hearts restlessly seeking to live in the fullness of life with Jesus, we feel His tender gaze upon us, the only one worth vying for. Sara's exquisite writing leads us to the heart of Christ. Her poignant vulnerability assures us that there is a divine purpose in everything we do. Absolutely nothing ever goes unnoticed by God who loves us and delights in us. Sara gives us treasured glimpses into her precious friendship with God. She makes us want to spend time with Him; to find our ultimate sense of fulfilment in His approval, and be content in His presence alone. Through Sara's words, we hear His voice and see Him work His miracle of grace in our hearts. Sara's life points us to Him. 'Unseen' inspires our hearts with the sterling knowledge that the most fruitful and fulfilling service to God is well off the beaten path, right in the heart of his will. There is divine conviction and confirmation in this true-to-the-gospel book. Let it revive your faith in the most eternally beautiful way. With profound wisdom and humble sincerity, Sara urges us to turn away from the noise of the world and delightfully waste time with God, pampering Him with our love. She give us a priceless gift in "Unseen", inviting us to realize the very purpose of our existence, created and redeemed to become fully alive in God. With profound wisdom and humble sincerity, Sara urges us to turn away from the noise of the world and delightfully waste time with God, pampering Him with our love. "Unseen" give us a priceless gift, inviting us to realize the very purpose of our existence, created and redeemed to become fully alive in God. Unseen is just the compass we need to chart us into safe waters. Sara reveals the hidden beauty of abiding in the unseen. In a world that is programmed to be seen, we come alive in the unseen. As the heart journeys into hiddenness, we are ushered into new-found identity and intimacy with God. In "Unseen", Sara Hagerty reveals herself so vulnerably with a rare, winsome transparency. She teaches us to desire the praise of God and not the fleeting praise of man. As we are faithful to Jesus in all the hidden, secret places, Sara's inspiring words give us God's perspective and clarity of vision on the unseen worth of our daily lives. "Unseen" inspires us to be faithful, to see beauty around us and to rest in God's sweet love each new day. Reaching deep down into our hearts, Sara inspires us to ignore the clamoring world and surge into the sacred space of His sanctuary, to hear His voice alone, in quietness and confidence. We are safe and secure in the palm of His hand, hidden in His gaze. In this exquisite book, Sara skillfully combines the art of storytelling with the Gospel. Jesus wants us to live life with Him, not just for Him. When we enjoy the affection of Christ, we do not crave the applause of man. Sara Hagerty's Unseen: The Gift of Being Hidden in a World that Loves to be Noticed is one of those rare books I can't put down and continue returning to even after I do. Struggling through her own personal spiritual experiences, Hagerty painstakingly confronts a peculiar moral dilemma when she questions her faith as to whether God who loves her when she serves him in full-time ministry work, still loves her when she is unseen and does not do anything for him. With a clarity and poignancy that ma Sara Hagerty's Unseen: The Gift of Being Hidden in a World that Loves to be Noticed is one of those rare books I can't put down and continue returning to even after I do. Struggling through her own personal spiritual experiences, Hagerty painstakingly confronts a peculiar moral dilemma when she questions her faith as to whether God who loves her when she serves him in full-time ministry work, still loves her when she is unseen and does not do anything for him. With a clarity and poignancy that makes Unseen a real spiritual gift, Hagerty explores how God still loves us -- even when we're unnoticed by the rest of the world. It's an insight and truth that can break open the Christian life -- that can break open every life -- to the reckless abandon of the joy and love found in living for others that doesn't need to be noticed in order to be loved. As her own heart breaks open in the midst of doubts and struggles, we find Hagerty being beckoned back to God, pursued by God, in love. This is a treasured account of what friendship with God looks like, when we discover that our very existence is predicated upon the love and kindness of a God who care for us without the strings attached. Learn to ignore all the clamoring for attention in our world, and discover the simple truth of the Gospel: "Maybe my seemingly unproductive, looking-up-at-Him life produces awe among the angels". This is one of those very special books that draw you closer to the Lord. As a result, you simply soak in every word as you read it slowly, pausing often to wonder and contemplate the glory of our King. I've been reading Sara's words for a few years now and start each day with the adoration scriptures she curates for her peeps. Sara has this wonderful writing style that combines the everyday happenings of her world with the grace and love of Jesus that make this book captivating. Her words lead y This is one of those very special books that draw you closer to the Lord. As a result, you simply soak in every word as you read it slowly, pausing often to wonder and contemplate the glory of our King. I've been reading Sara's words for a few years now and start each day with the adoration scriptures she curates for her peeps. Sara has this wonderful writing style that combines the everyday happenings of her world with the grace and love of Jesus that make this book captivating. Her words lead you to Jesus, to His wonder, love and glory. Sara invites us into her journey into the hiddenness of parenting 6 young kiddies, most of whom are adopted, where she finds Jesus in all she does and thinks. Sara's discovered how to "listen for His heart and His soft whisper in His Word" in the everyday unseen moments. She's found a friend. Who happens to be her Lord and Creator. Sara weaves Mary of Bethany's testimony of a wasted life throughout her own journey. It's brilliantly done. Jesus told us Mary's story would be forever re-told and here we see it again used so powerfully to display what being a friend of Jesus looks like. I found I had to read this slowly, a chapter at a time to savour the thoughts and reflect on my own relationship with Jesus. There were 2 particularly excellent chapters that I enjoyed immensely. Chapter 8 where Sara provides insights into the daily habits that have helped her friendship with Jesus and then the final chapter where she encourages us to experience such a friendship. I received a PDF copy of the book from the author, well her husband in fact, with no expectation of a favourable review. However, I noticed my pre-ordered copy has now shipped and I'm expectantly waiting it so I can mark it up as I read through it for a second time. "Unseen" is part memoir and part Bible study. Her intent is to help draw people into a closer relationship with God. The author looked at how Mary lavishly "wasted" her time (and perfume) on Jesus and was praised for it. Using Mary's story as a jumping off point, she talked about things that happened in her life that illustrated a certain point or that showed how mundane moments drew her closer to God. As a young adult, she felt that any minute not spent serving God was "wasted," so the overall t "Unseen" is part memoir and part Bible study. Her intent is to help draw people into a closer relationship with God. The author looked at how Mary lavishly "wasted" her time (and perfume) on Jesus and was praised for it. Using Mary's story as a jumping off point, she talked about things that happened in her life that illustrated a certain point or that showed how mundane moments drew her closer to God. Just finished this gem. As I dug deeper into the book I found myself feeling like I was sitting with a friend I’d known for years sharing our hearts together. Sara Hagerty wrote with such genuine transparency and strength that could only be the product of spending hundreds of hours alone and UNSEEN with Christ. Her prayer, “Jesus, sitting at Your feet is never a waste of time”, was highlighted and focused on throughout the entire book. She humbly reiterates that communion with God happens when o Just finished this gem. As I dug deeper into the book I found myself feeling like I was sitting with a friend I’d known for years sharing our hearts together. Sara Hagerty wrote with such genuine transparency and strength that could only be the product of spending hundreds of hours alone and UNSEEN with Christ. Her prayer, “Jesus, sitting at Your feet is never a waste of time”, was highlighted and focused on throughout the entire book. She humbly reiterates that communion with God happens when our “relationship...is cultivated when no one else is looking”. "I have a version of my story, a shiny version fit to put on any Christmas card. But God's version is far richer. It's deeper and it's layered with purpose. His version of my story stretches beyond what I can see. It includes more twists and turns, goodness and glory, than my mind can construct." "Lovers will always outwork workers." "God made us in secret. We grow in secret. But that secret space is not a void. He stays in the secret, right there with us, that's where we grow, deep." I really enjoyed this book and it felt like many of the books I have been reading lately but brought a lot of ideas together. In this book Sara Hagerty discusses how God works in us in the small ways and considers how our vulnerability and weakness are signs to turn to God. She suggests that our lives do not always need to be big and flashy but the smaller moments are the ones that bring us joy and peace. This book took me a long time to finish because there is SO MUCH to absorb and process! While I have not read the author's first book, "Everything Bitter is Sweet," I can say this one spoke to me on virtually every page. Her themes of Hiddenness in Christ, Unceasing Prayer (and what that really means), Wasting Time with Jesus, etc. are all concepts that have resonated in my life over many years. If these topics are of interest to you, GET THIS BOOK!!! Inspirational reading. I read it quickly (sort of) and it warrants another, slower reading. Very encouraging for anyone who feels unnoticed, unapplauded. Sara Hagerty reminds us that nothing is unimportant to our Creator, that every little act of service is valued, and that being hidden is a gift. This book will lead you to wonder how God sees you in the most ordinary moments of life. Absolutely wonderful and so needed! Her vulnerability was encouraging and her message eye-opening. I am leaving with so much more than I expected. If you long to make a difference in the seemingly ordinary and invisible place that God has called you to be, then Unseen by Sara Hagerty is a book that you must read. Sara is a natural-born storyteller who weaves pieces of her life with stories from the Bible and shares lessons that can lead to aha moments of transformation. This is not a book to read in one sitting, but rather, a book to savor and process. It’s particularly suited for readers who enjoy reflective non-fiction. This review is an e If you long to make a difference in the seemingly ordinary and invisible place that God has called you to be, then Unseen by Sara Hagerty is a book that you must read. Sara is a natural-born storyteller who weaves pieces of her life with stories from the Bible and shares lessons that can lead to aha moments of transformation. This review is an excerpt from the original review that is published on my blog. To read my review in its entirety, please visit Create With Joy. Disclosure: I received a copy of this book from the publisher. The opinions expressed in this review are entirely my own, based on my assessment of this book. 3.5 stars. The main points of the book are really good.